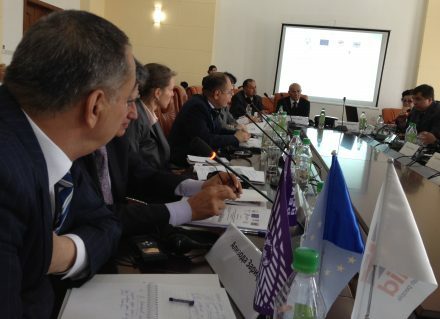 On 15 April 2014 PRI organised a Regional Conference ‘Towards a Complete Abolition of the Death Penalty in Tajikistan: Experience of Central Asian Countries’. The event was organised in cooperation with Presidential Administration of the Republic of Tajikistan, the Swiss Cooperation Office, League of women lawyers in Tajikistan, with the financial support of UK aid and European Union. Welcoming speeches were made by Mr. Muzaffar Ashuriyon, Head of department of human rights guarantees of the executive office of the President of the Republic of Tajikistan, MP Mahmadali Vatanov and PRI CA Death penalty project coordinator Dinara Dildabekova. The event was especially organised in prior to the annual President’s message to the citizens of the Republic of Tajikistan, as in President`s message in 2013 it was stated that it was right time that this issue [death penalty] to be reviewed by relevant authorities and parties concerned, taking into account public opinion, and based on its results submit proposals in order to determine position of the state with regard to a death sentence. The main goal of the event was the discussion of steps of Central Asian countries to the complete abolition of the death penalty. The conference embraced the most important and significant problems on capital punishment and what issues may occur after it`s abolition. During the conference the experiences of Tajikistan, Kazakhstan and Kyrgyzstan were presented. The conference discussion embraced following issues: UN Agencies’ recommendations on a complete abolition of the death penalty in Central Asian counties; Central Asian countries’ policy on complete abolition of the death penalty; activities of governmental working groups and initiatives to study the death penalty abolition in Central Asian countries; Central Asian countries’ legislation on death penalty abolition; major challenges towards a complete abolition of death penalty in Central Asia; Educational and awareness raising measures; results of public opinion on the issue; promotion of death penalty abolition issues at the national and international levels: international advocacy, participation in the process of legislation improvement and policy establishment; humanization of the criminal legislation; reform of the criminal law system and access to life prisoners. PRI’s Central Asia Death Penalty Project Coordinator Dinara Dildabekova made a presentation on the role of parliamentarians and civil society in the fights to abolish death penalty in Kazakhstan. She emphasised the huge impact that parliamentarians as decision makers can make to the abolition of the capital punishment. Worldwide as well as in Kazakhstan MPs have the capacity to table and amend legislation and make policy changes to affect the application of the death penalty and its alternative sanctions. However, parliamentarians need ongoing support to take progressive but unpopular steps. Moreover, this work cannot be done without support from the civil society. Civil society can have a long-term impact on implementing human rights and for creating a sustained groundswell towards reform, especially when coupled with efforts such as lobbying of government officials and raising the public’s awareness. During the conference the results of public survey were presented. It showed that the majority (67.18 %) are in favour to abolish death penalty in Tajikistan. This survey was prepared by experts from the Public Foundation Nota Bene in the framework of the Small Grants Programme of Penal Reform International in Central Asia, as part of the project “Progressive abolition of the death penalty and implementation of humane alternative sanctions after a moratorium or abolition”, funded by the European Union and the Swiss Human Rights Programme. At the closing session and wrap-up, participants produced recommendations and afterwards submitted them to the Presidential Administration. In 2004 Tajikistan declared a moratorium on setting and application of death sentence. In 2010 the Commissioner for human rights in Republic of Tajikistan indicated his intention for complete abolition of the death penalty. In the same year by Presidential Decree the working group for researching of social and legal aspect of possibility of abolition of death penalty was created. More than 50 people serve life imprisonment. For period from 2001 till 2003 133 death sentences were executed (2001- 68 death sentences, 2002 – 31 sentences, 2003- 34 sentences). Burial ground of people sentenced for death penalty are restricted and relatives are not informed. This public opinion survey in four regions of Tajikistan, produced by small grant recipient Nota Bene, shows support for abolition has increased significantly since 2010.